Without doubt or contradiction, Speculative Freemasonry as an institution is a research. Within our hallowed halls and around our altars, we have taken an obligation to RE-SEARCH and EXAMINE ourselves and the worlds around us; thus, making Masonic research the quintessential nature of our Craft. Countless hours of study and labor conducted by Freemasons across the globe has but one and the same object, TRUTH. And, in this world of duality, so Truth must have its antithesis, Falsehood. Amidst this universal struggle between Truth and falsehood the Mason stands, and by his own volition, makes the final determination of which will sit as ruler of his own conscience. Three years ago, a course was set for me, a search for Truth regarding the start and origin of African Lodge No. 1, and ultimately of what is called, “Prince Hall Freemasonry.” At the time, being a proud “Prince Hall Freemason” and historian, I deemed it vital and of the highest importance to be able to present answers and documentation to support what I truly believed to be the truth. With the multitude of debates against clandestine “black lodges,” to the sincere questions posed by “Prince Hall Masons,” it was my hope to be able to provide undeniable answers to these debates and questions. This reSEARCH for Truth led to the writing and publishing of the book, Landmarks of our Fathers: A Critical Analysis of the Start and Origin of African Lodge No. 1. I can vividly remember conversations with Masonic greats, such as my mentors, Ralph McNeal and Ezekiel M. Bey, Past President of the Phylaxis Society, Hon. John Williams, and my editor (and now Vice President of the Masonic Society) Oscar Alleyne counseling me on the backlash of politics that would come into play once Landmarks of our Fathers was released to the Masonic and the general public. Their wisdom and my own life lessons had prepared me for the task ahead; the great battle with Falsehood. This new publication, Examination of the White Paper: Politics in Masonic Research, is an ode to Masonic research. It is a demonstration of the power of Masonic research, and a return of Truth to the forefront of the Craft. It is a clarion call for Research Societies and Grand Historians to stay the course; to remain constant in the face of jurisdictional politics that attempt to use the cable-tow to tie and bind the hands of our modern vanguards and custodians of Truth. 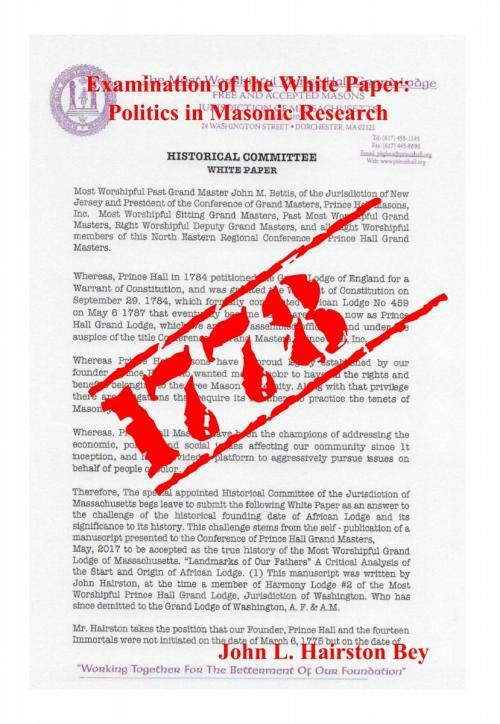 The White Paper is a 16 page, two-year work of the Historical Committee of the Most Worshipful Prince Hall Grand Lodge of Massachusetts, adopted by the Conference of Grand Masters (PHA). This attempted response and rebuttal to Landmarks of our Fathers will be laid bare, and proved to be a trichotomy of problematic issues facing Masonic research regarding “Prince Hall Freemasonry”. It is a little-known fact among the general membership of “Prince Hall Freemasons” that the M.W. Prince Hall Grand Lodge of Massachusetts maintains and controls the faulty narratives that have plagued Masonic research among Prince Hall jurisdictions and research societies for years. We do not have to look further than the Historical Committee of the Conference of Grand Masters, which, out of 6 members, seats three members of the Historical Committee of the M. W. Prince Hall Grand Lodge of Massachusetts; of which, the present Grand Master of the M.W. Prince Hall Grand Lodge of Massachusetts (and signer of the White Paper), M. W. Yves-R. Maignan sits as Chairman. The Historical Committee of the M.W. Prince Hall Grand Lodge of Massachusetts, having assumed the role of “Conservators and Preservers of the History of Prince Hall Freemasonry,” has an unequaled responsibility to conserve and preserve the AUTHENTIC history of “Prince Hall Freemasonry”. It is their duty and obligation, as custodians of the root and legacy of African Lodge No. 1, to maintain the integrity of Masonic research and scholarship. Yet this has not been the case. In other words, the history of Prince Hall Freemasonry in jurisdictions OUTSIDE of Massachusetts must conform to the narrative that serves to keep their Grand Lodge at the head of Prince Hall Freemasonry. As I develop my response to their “White Paper,” what will become evident is an agenda of propaganda and a revisionist campaign, headed by the historical committee of the M. W. Prince Hall Grand Lodge of Massachusetts, in the cause of maintaining an unsubstantiated historical narrative. This false narrative is the gatekeeper that preserves the M.W. Prince Hall Grand Lodge of Massachusetts as the source of Masonic authority among Prince Hall Grand Lodges. I understand the initial shock of my statements before I wrote them, and I am fully aware that I will be taken to task for it. But, I am also fully prepared to take the front lines, as a fellow Masonic researcher, with up and coming vanguards (historians) of Prince Hall Masonic history, to usher in a new era in Masonic research among the Prince Hall Affiliation. What follows is a critical examination of the “White Paper” and an expose’ of the detrimental impacts of jurisdictional politics in Masonic Research.